New one....font is much easier on the eyes. I’m using Firefox on iOS. Am I doing something wrong? Please let me know if this issue persists. Give it a day or two. Should I wait 2 days on Prosilver and then switch, or continue on the new style for 2 days? New one is totally better. However, what happened to all the posts between last week and February 2017?? I was looking at the Grand Rapids posts and that entire block of posts is just outright missing. I was thinking someone revived an old thread when I notice one from last year February with no recent reply on it, but there's no such sign of it. Looking more closely, 20 months of posts are gone. I know that old posts are regularly deleted, as I've looked back at my old posts from 5+ years ago and they're all deleted, but... one or two weeks ago is too recent to have been deleted. EDIT: all posts site-wide are gone from Feb. 2017 pretty much up to Halloween or so. All is explained two threads below this one. Vic - from the index page (home page), you can find that option under "Quick Links," which is located in the black horizontal menu bar near the top of the page. I see that I'm still having some CloudFlare-related caching issues. I'll try to fix this later today. I definitely do NOT like how text renders in flat style. Prosilver text looks fine. Other than the text, flat style is great. As long as I can still set Prosilver in my control panel, I'll be happy! Your issue appears to be with your device or browser display settings. Flat definitely looks worse on your device, but prosilver also appears worse than it should. The good news is you can still access prosilver by changing your board preferences in the user control panel. Just keep in mind, though, that you'll need to be logged in to use your customized preference settings. When I logged in just now it reverted back to the old stylesheet. Before I logged in it displayed the new stylesheet. Strange. Edit: Just discovered this can be customized in the UCP. Learn something new every day. There are still some funky caching issues going on. I have a vacation day scheduled for tomorrow (11/9). I'll work on this then. Thanks for your patience. I like the new version much better. It doesn't look "out of the box" and is easier to read. I have not had any issues reverting back to the old stylesheet. Could it be a browser issue? I use Edge and am on Windows 10. I've had no issues with Chrome over the past few days. I clear my temp internet files regularly, which perhaps helps. I think I figured out why it reverts to the old theme. The new theme that M.W. set is a default for anyone who isn't logged in. Once you log in the theme defaults to whatever preference is set in the User Control Panel (my UCP default was the old theme). Each user has the option to change their theme in the UCP. I hadn't discovered this before, but there are a number of themes from which to choose and we can pick whatever theme we want based on our individual preference (the new default theme is one of the options). We will see the default theme until we log in, at which time the theme will switch to whatever we set in the UCP. It's kinda cool in that we can pick whatever theme we want to see when we're logged in. You are absolutely right. If you've manually changed (at some point) your theme in the UCP, you will continue to see that theme when logged in. I technically do have the ability to manually override everyone's UCP theme settings, but I have not invoked that option in my Administration Control Panel. I want to give everyone the ability to customize! 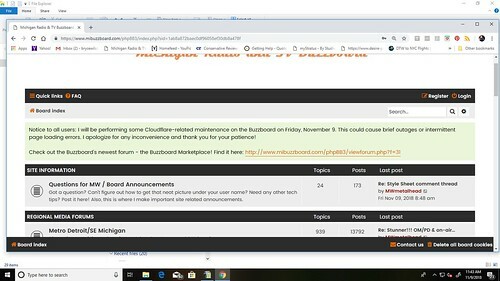 Obviously, if viewing the Buzzboard on a logged out basis, any custom preferences you've set in the UCP will not take effect until the next time you log back in. This is what I see when not logged in. It changes when I am logged in. Is what I'm seeing when not logged in the new standard format? I like it.